Born 27 April 1872 in Blackburn, Lancashire [registered in Blackburn, June 1872]. Baptised 20 October 1872 in St Mary the Virgin Church, Blackburn. They live in Islington, Blackburn, baptised by vicar E. Birch. His father, William Henry is a tackler. According to the 1881 census, Albert E. Houlker is the second of five children to William and Clementine. Working in the cotton mill, his father is a power loom overlooker, his mother is a weaver. They live at 12 Carlisle Street in Blackburn. According to the 1891 census, Albert now has a further three younger siblings, and along with two other siblings, they live with his widowed father at 39 Carlisle Street. Albert is a cotton weaver, his father an overlooker. According to the 1901 census, Albert is a widower and an overlooker in the cotton mill. He lives in 47 Hope Street in Blackburn. According to the 1911 census, Albert has remarried, another Elizabeth, and they have four children, Elizabeth Ann, Clementyna, Andrey and Albert Edward. Albert is a poer loom overlooker and they all live at 2 Spring View in Blackburn. According to the 1939 register, Albert and Elizabeth are married and living at 160 Downham Street in Blackburn, he is a carrier and coal merchant. Married twice, firstly to Elizabeth Ann Haworth, at Christ Church, Mosely Street in Blackburn, 1896 [registered as Houlkes, in Blackburn, June 1896]. Elizabeth died end of 1898/beginning of 1899 [death registered March 1899]. Secondly to Elizabeth Ormerod [registered in Blackburn, June 1901]. 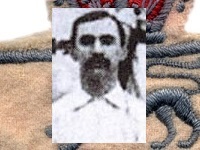 Died 27 May 1962 in Blackburn, aged 90 years 30 days [registered in Blackburn, June 1962]. Height/Weight 5' 6½", 10st. 5lbs . Newspaper reports at the time of his transfer to Portsmouth FC gave him a weight of 10st. 8lbs. Club(s) Played schoolboy football in Blackburn and then assisted several junior clubs in that town's district, including Blackburn Hornets FC, Oswaldtwistle Rovers FC, Cob Wall FC and Park Road FC, before joining Blackburn Rovers FC in the 1893-94 season. He made 121 league appearances, scoring twice, before he signed for Portsmouth FC on 2 May 1902, after the replayed British Championship match. Made 23 Southern League appearances, scored once. Joined Southampton FC on 1 May 1903, making another 59 Southern League appearances, scoring three goals. Houlker was allowed by the FA to return to Blackburn Rovers FC on 7 May 1906. The transfer was finally confirmed on 15 July, because Southampton had offered Kelly the maximum wage, thus making any move from club against the rules and therefore implausible, but he had been required to carry on his trade in his hometown and was permitted to return home, he did so for another thirty league appearances, he retired a year later. Houlker did play for Colne FC in September 1909. He signed with them on 6 September 1910 and played with them until at least November 1911 Also played as an emergency back-up for Blackburn Rovers FC in a wartime match on 26 January 1918 and once more on 16 March, five weeks away from his 46th birthday. Player number One of two who became 276th players (277) to appear for England. First match No. 76, 3 May 1902, England 2 Scotland 2, a replayed British Championship match at Aston Lower Grounds, Trinity Road, Aston, Birmingham, aged 30 years 6 days. Last match No. 87, 19 March 1906, Wales 0 England 1, a British Championship match at Cardiff Arms Park, Temperance Town, Cardiff, aged 33 years 326 days. On leaving football was an overlooker at a Blackburn mill, then ran a coal and haulage business in the town before retiring in 1947. - An English Football Internationalists' Who's Who. Douglas Lamming (1990). Hatton Press, p.137.